Made in America by a manufacture who prides themselves on comfort, this chair is sure to help you relax at the end of the day. This chair features a vast assortment of add-on features that you can use to create the comfort and functionality that you most desire. Features include manual recline, power recline and power headrest options. This chair can also be customized in a large assortment of upholstery options through special order methods. 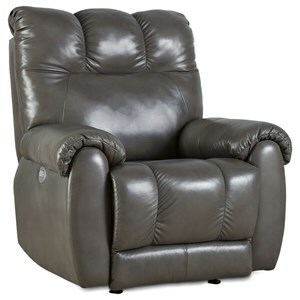 The Top Flight Power Headrest Lay Flat Recliner by Southern Motion at Hudson's Furniture in the Tampa, St Petersburg, Orlando, Ormond Beach & Sarasota Florida area. Product availability may vary. Contact us for the most current availability on this product. Fabric Options Items in this collection area available in a large assortment of upholstery options through special order methods. Browse other items in the Top Flight collection from Hudson's Furniture in the Tampa, St Petersburg, Orlando, Ormond Beach & Sarasota Florida area.